August 1, 2012 | Stavros Halvatzis Ph.D. The main structural hoists between the 1st and 2nd turning points are: the 1st pinch, the midpoint, and the 2nd pinch. 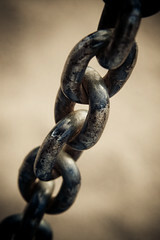 In this post, we explore the dynamic relationship that exists between these structures. The 1st pinch is a scene or scene sequence that occurs about halfway through the first part of act ii and the midpoint. It helps to keep things moving by propelling events toward the midpoint and the moment of illumination that occurs there. The 1st pinch feeds off the 1st turning point, reminding us of what is at stake. Its relationship to the 1st turning point, therefore, is not of one of surprise or deviation, but of reiteration. This is because the 1st turning point has already changed the story’s direction and the task of the 1st pinch is to keep the story on track by subtly and adroitly reminding us of this fact, not to surprise us by introducing yet another change in direction. The 2nd pinch is a scene or scene sequence that occurs halfway between the midpoint and the end of act ii. As with the 1st pinch, the 2nd pinch keeps the story on track by revisiting, through a single scene, or scene sequence, the (changed) concerns of the story and propels it towards the 2nd turning point. 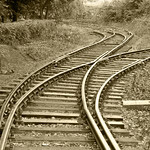 The relationship between the 2nd pinch and the 2nd turning point, however, is now one of deviation and surprise, since the task of the 2nd turning point is to spin the story around in a different direction by introducing a new challenge, or by deepening the existing one in a game of rising stakes. Sometimes a strong symmetry obtains between the 1st and 2nd pinch. In his book, The Screenwriters Workbook, Syd Field points to an example of such symmetry in the film, Thelma and Louise. The 1st pinch occurs when the two girls pick up J.D. (Brad Pitt) who then proceeds to steal their money (at the Midpoint). The 2nd pinch occurs when J.D. is picked up by the police and rats on the two women by telling the cops that the women are headed for Mexico, thus sealing their fate. Pinches 1 & 2 are scenes or scene sequences that keep the story on track by reminding the reader or audience of the central concerns of the story initiated by the 1st turning point. The relationship of the 1st pinch to the 1st turning point is one of reiteration; that of the 2nd pinch to the 2nd turning point is one of surprise and deviation. This entry was posted in Story Structure and tagged midpoint, Pinch, screenwriting, story, story structure, Turning-point, writing on August 27, 2012 by Stavros Halvatzis. Understanding story structure involves different stages of learning. The first stage is to identify, name, and understand the function of each narrative component. We learn that a turning point, for example, spins the story in a different direction, and we learn that in a typical story there are two such turning points. But looking at individual elements in this way provides us with a static picture. It tells us what the elements do, and where they occur, individually, but not how they interact with each other to produce a cohesive and dynamic narrative. This is very much a case of the sum of the parts being less than the whole: we cannot unlock the full meaning of a text unless we trace the links between the narrative elements, understand that they form a network, and explore how that network functions. Individual structural units, seen in isolation, therefore, surrender less information than they do when studied as a network. The following series of posts tries to remedy this situation by exploring these important interrelationships, starting with the inciting incident and the first tuning point. For the purposes of this post, the typical starting point – the ordinary world – is treated as given. The inciting incident, we are reminded, is an event that gets the story rolling. It usually occurs after the ordinary world of the Hero has been established and takes the form of a disturbance to the status quo of this world. The inciting incident is often mistaken as the start of the story, precisely because it jump-starts the tale by relating its first significant event. In media res beginnings, the inciting incident replaces the introduction to the ordinary world, injecting a sense of excitement and urgency at the start of the story at the expense of context. The first turning point is the true start of the story because it presents new information which forces the Hero to respond to a challenge, opportunity, or threat, hatch a plan, and embark on a series of actions to implement this plan which affect the entire story. It differs from the inciting incident in that it introduces information that spins the story in a different direction than that suggested by the inciting incident. The relationship of the inciting incident to the first turning point, is, therefore, one of deviation resulting from a surprising and unexpected change – a rotation, or alteration to the path initiated by the inciting incident. One can only understand the inciting incident, therefore, by relating it to the ordinary world before it, and the first turning point ahead of it, just as one can only understand the first turning point in relation to the inciting incident and the structural nodes ahead of it – but more of that in next week’s post. Understanding structure relies not only on an understanding of discreet structural units, but of the links that exist between them. Each structural node exists in a dynamic relationship to the other nodes in the narrative network and can, therefore, only be understood in relation to the overall network. This entry was posted in Story Structure and tagged first turning point, Inciting Incident, mwriter, narrative, screenwriter, story, structure, writing on August 20, 2012 by Stavros Halvatzis. This is the second and final installment of The Nuts and Bolts of Story Structure. As mentioned previously, pinches are scenes located within act II that remind us of the major concerns of the story. Their main propose is to keep the story on track. If the first pinch in The Matrix has Neo fail to leap successfully to the adjacent building, the second has him reel in a helicopter via an attached cable. The second pinch is related to the first, then, in that it revisits and develops the concerns posed by the first. As with the first turning point, this structural device turns the story around in an unexpected way. Up to now, the Hero has accepted a challenge or opportunity, acquired a goal, grown through moral insight, and pressed forward towards achieving that goal, despite mounting obstacles. Now, a new situation arises – usually prompted by antagonistic forces – that ups the stakes, forcing a reassessment of, and adjustment to, the original goal. The second turning point in Unforgiven occurs when William Munny learns that Ned Logan (Morgan Freeman), his best friend, has died at the hands of the sheriff; Munny, who has already fulfilled his contract, has no choice but to expand his goal and seek revenge on all those who participated in Ned’s death. This scene, also known as the must-have confrontational scene, pits the Hero and antagonist against each other in a fight to the finish (either literally, or metaphorically). Its outcome establishes the theme of the story – for example, that good triumphs over evil. In The Matrix Neo is resurrected through the power of love and faith, symbolised by a kiss. In a typical conventional story with an up-ending, the Denouement Scene ties up loose ends, answers earlier questions, and unites the Hero with his community and love-interest. In a down-ending, the Hero is defeated in some important way – he may, for example, win the battle but lose the war, lose some moral or spiritual aspect of himself, fail to win the girl, leave questions unanswered and issues unresolved. Here, the theme may well be that evil triumphs over good, or that good guys finish last. I’ve left the mention of the Realisation Scene (see past post) till last, not because it necessarily occurs at the end of the story, but because it is a scene that injects new information about the plot – it allows the Hero to get at the truth. Most typically, the Realisation Scene (and its decision/action consequences) occurs at the first turning point, or the midpoint, or even as late as the second turning point, although this is less common, since it places the engaging and dynamic realisation-decision-action cluster towards the end of the story. Story structure comprises of certain must-have, or master scenes, which form the undercarriage of the entire tale. Additionally, linking and transitional scenes abound. 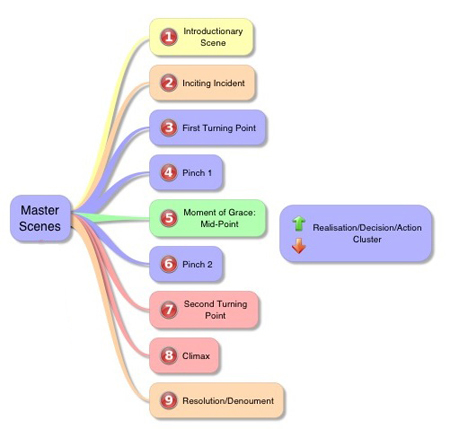 Other important scenes include the realisation-decision-action cluster, which can occupy any one of several points in the story, depending on the individual needs of the story itself. This entry was posted in Story Structure and tagged climactic scene, denouement, Inciting Incident, midpoint, Pinch, screenwriting, story, story structure, tuning point, writing on August 6, 2012 by Stavros Halvatzis.